Dr. Makkapati was born in India, but spent the vast majority of her youth in Southeast Iowa. After graduating from Burlington High School in 1984, she completed her undergraduate degree at the University of Iowa in 1989. Dr. Makkapati graduated from medical school at University of Health Sciences College of Osteopathic Medicine in Kansas City in 1993. She completed her residency in OB/GYN at the State University of New York-Buffalo in 1998 and immediately joined West Des Moines OB/GYN Associate. Dr. Makkapati became certified by the American Board of Obstetrics & Gynecology in 2002 and became a Fellow of the American College of Obstetricians and Gynecologists (F.A.C.O.O.G.) in 2002. 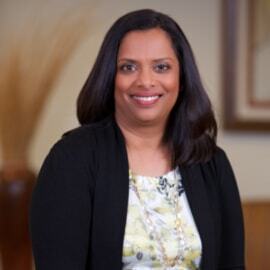 Dr. Makkapati and her husband, Ravi, have a daughter and a son and live in West Des Moines. In her spare time, she enjoys family activities, cooking and traveling.